1 A None No Power Seat 1 A is a standard Business Class suite that features a seat that converts into a lie flat bed however, the proximity to the lavatory and galley may be bothersome. 1 G None No Power Seat 1 G is a standard Business Class suite that features a seat that converts into a lie flat bed however, the proximity to the lavatory and galley may be bothersome. 1 K None No Power Seat 1 K is a standard Business Class suite that features a seat that converts into a lie flat bed however, the proximity to the lavatory and galley may be bothersome. 12 A None No Power Seat 12 A is a standard Premium Economy class seat that has limited legroom. On flights within North America, Air Canada classifies this seat as Economy. There is no floor storage for this seat during takeoff and landing. The tray table and video monitor are in the armrest, making the armrest immovable and slightly reducing seat width. 12 C None No Power Seat 12 C is a standard Premium Economy class seat that has limited legroom. On flights within North America, Air Canada classifies this seat as Economy. There is no floor storage for this seat during takeoff and landing. The tray table and video monitor are in the armrest, making the armrest immovable and slightly reducing seat width. 12 D None No Power Seat 12 D is a standard Premium Economy class seat that has limited legroom. On flights within North America, Air Canada classifies this seat as Economy. There is no floor storage for this seat during takeoff and landing. The tray table and video monitor are in the armrest, making the armrest immovable and slightly reducing seat width. 12 E None No Power Seat 12 E is a standard Premium Economy class seat that has limited legroom. On flights within North America, Air Canada classifies this seat as Economy. There is no floor storage for this seat during takeoff and landing. The tray table and video monitor are in the armrest, making the armrest immovable and slightly reducing seat width. 12 G None No Power Seat 12 G is a standard Premium Economy class seat that has limited legroom. On flights within North America, Air Canada classifies this seat as Economy. There is no floor storage for this seat during takeoff and landing. The tray table and video monitor are in the armrest, making the armrest immovable and slightly reducing seat width. 12 H None No Power Seat 12 H is a standard Premium Economy class seat that has limited legroom. On flights within North America, Air Canada classifies this seat as Economy. There is no floor storage for this seat during takeoff and landing. The tray table and video monitor are in the armrest, making the armrest immovable and slightly reducing seat width. 12 K None No Power Seat 12 K is a standard Premium Economy class seat that has limited legroom. On flights within North America, Air Canada classifies this seat as Economy. There is no floor storage for this seat during takeoff and landing. The tray table and video monitor are in the armrest, making the armrest immovable and slightly reducing seat width. 13 A None No Power Seat 13 A is a standard Premium Economy class seat. On flights within North America, Air Canada classifies this seat as Economy. 13 C None No Power Seat 13 C is a standard Premium Economy class seat. On flights within North America, Air Canada classifies this seat as Economy. 13 D None No Power Seat 13 D is a standard Premium Economy class seat. On flights within North America, Air Canada classifies this seat as Economy. 13 E None No Power Seat 13 E is a standard Premium Economy class seat. On flights within North America, Air Canada classifies this seat as Economy. 13 G None No Power Seat 13 G is a standard Premium Economy class seat. On flights within North America, Air Canada classifies this seat as Economy. 13 H None No Power Seat 13 H is a standard Premium Economy class seat. On flights within North America, Air Canada classifies this seat as Economy. 13 K None No Power Seat 13 K is a standard Premium Economy class seat. On flights within North America, Air Canada classifies this seat as Economy. 14 A None No Power Seat 14 A is a standard Premium Economy class seat. On flights within North America, Air Canada classifies this seat as Economy. 14 C None No Power Seat 14 C is a standard Premium Economy class seat. On flights within North America, Air Canada classifies this seat as Economy. 14 D None No Power Seat 14 D is a standard Premium Economy class seat. On flights within North America, Air Canada classifies this seat as Economy. 14 E None No Power Seat 14 E is a standard Premium Economy class seat. On flights within North America, Air Canada classifies this seat as Economy. 14 G None No Power Seat 14 G is a standard Premium Economy class seat. On flights within North America, Air Canada classifies this seat as Economy. 14 H None No Power Seat 14 H is a standard Premium Economy class seat. On flights within North America, Air Canada classifies this seat as Economy. 14 K None No Power Seat 14 K is a standard Premium Economy class seat. On flights within North America, Air Canada classifies this seat as Economy. 18 A None No Power Seat 18 A is a standard Economy Class seat that has additional legroom. There is no floor storage for this seat during takeoff and landing. The tray table and video monitor are in the armrest, making the armrest immovable and slightly reducing seat width. 18 C None No Power Seat 18 C is a standard Economy Class seat that has additional legroom. There is no floor storage for this seat during takeoff and landing. The tray table and video monitor are in the armrest, making the armrest immovable and slightly reducing seat width. 18 D None No Power Seat 18 D is a standard Economy Class seat that has additional legroom. There is no floor storage for this seat during takeoff and landing. The tray table and video monitor are in the armrest, making the armrest immovable and slightly reducing seat width. 18 E None No Power Seat 18 E is a standard Economy Class seat that has additional legroom. There is no floor storage for this seat during takeoff and landing. The tray table and video monitor are in the armrest, making the armrest immovable and slightly reducing seat width. 18 F None No Power Seat 18 F is a standard Economy Class seat that has additional legroom. There is no floor storage for this seat during takeoff and landing. The tray table and video monitor are in the armrest, making the armrest immovable and slightly reducing seat width. 18 G None No Power Seat 18 G is a standard Economy Class seat that has additional legroom. There is no floor storage for this seat during takeoff and landing. The tray table and video monitor are in the armrest, making the armrest immovable and slightly reducing seat width. 18 H None No Power Seat 18 H is a standard Economy Class seat that has additional legroom. There is no floor storage for this seat during takeoff and landing. The tray table and video monitor are in the armrest, making the armrest immovable and slightly reducing seat width. 18 K None No Power Seat 18 K is a standard Economy Class seat that has additional legroom. There is no floor storage for this seat during takeoff and landing. The tray table and video monitor are in the armrest, making the armrest immovable and slightly reducing seat width. 2 A None No Power Seat 2 A is a standard Business Class suite that features a seat that converts into a lie flat bed. 2 G None No Power Seat 2 G is a standard Business Class suite that features a seat that converts into a lie flat bed. 2 K None No Power Seat 2 K is a standard Business Class suite that features a seat that converts into a lie flat bed. 3 A None No Power Seat 3 A is a standard Business Class suite that features a seat that converts into a lie flat bed. 3 G None No Power Seat 3 G is a standard Business Class suite that features a seat that converts into a lie flat bed. 3 K None No Power Seat 3 K is a standard Business Class suite that features a seat that converts into a lie flat bed. 31 D None No Power Seat 31 D is a standard Economy Class seat however, the proximity to the lavatory may be bothersome. This seat may also have limited recline. 31 E None No Power Seat 31 E is a standard Economy Class seat however, the proximity to the lavatory may be bothersome. This seat may also have limited recline. 31 F None No Power Seat 31 F is a standard Economy Class seat however, the proximity to the lavatory may be bothersome. This seat may also have limited recline. 31 G None No Power Seat 31 G is a standard Economy Class seat however, the proximity to the lavatory may be bothersome. This seat may also have limited recline. 32 A None No Power Seat 32 A is a standard Economy Class seat however, the proximity to the lavatory may be bothersome. This seat may also have limited recline. 32 C None No Power Seat 32 C is a standard Economy Class seat however, the proximity to the lavatory may be bothersome. This seat may also have limited recline. 32 H None No Power Seat 32 H is a standard Economy Class seat however, the proximity to the lavatory may be bothersome. This seat may also have limited recline. 32 K None No Power Seat 32 K is a standard Economy Class seat however, the proximity to the lavatory may be bothersome. This seat may also have limited recline. 34 D None No Power Seat 34 D is a standard Economy Class seat that has additional legroom due to the exit. The proximity to the lavatories may be bothersome. There is no floor storage for this seat during takeoff and landing. The tray table and video monitor are in the armrest, making the armrest immovable and slightly reducing seat width. 34 E None No Power Seat 34 E is a standard Economy Class seat that has additional legroom due to the exit. The proximity to the lavatories may be bothersome. There is no floor storage for this seat during takeoff and landing. The tray table and video monitor are in the armrest, making the armrest immovable and slightly reducing seat width. 34 F None No Power Seat 34 F is a standard Economy Class seat that has additional legroom due to the exit. The proximity to the lavatories may be bothersome. There is no floor storage for this seat during takeoff and landing. The tray table and video monitor are in the armrest, making the armrest immovable and slightly reducing seat width. 34 G None No Power Seat 34 G is a standard Economy Class seat that has additional legroom due to the exit. The proximity to the lavatories may be bothersome. There is no floor storage for this seat during takeoff and landing. The tray table and video monitor are in the armrest, making the armrest immovable and slightly reducing seat width. 35 A None No Power Seat 35 A is a standard Economy Class seat that has additional legroom due to the exit, however, the proximity to the lavatories may be bothersome. There is no floor storage for this seat during takeoff and landing. The tray table and video monitor are in the armrest, making the armrest immovable and slightly reducing seat width. 35 C None No Power Seat 35 C is a standard Economy Class seat that has additional legroom due to the exit, however, the proximity to the lavatories may be bothersome. There is no floor storage for this seat during takeoff and landing. The tray table and video monitor are in the armrest, making the armrest immovable and slightly reducing seat width. 35 H None No Power Seat 35 H is a standard Economy Class seat that has additional legroom due to the exit, however, the proximity to the lavatories may be bothersome. There is no floor storage for this seat during takeoff and landing. The tray table and video monitor are in the armrest, making the armrest immovable and slightly reducing seat width. 35 K None No Power Seat 35 K is a standard Economy Class seat that has additional legroom due to the exit, however, the proximity to the lavatories may be bothersome. There is no floor storage for this seat during takeoff and landing. The tray table and video monitor are in the armrest, making the armrest immovable and slightly reducing seat width. 4 A None No Power Seat 4 A is a standard Business Class suite that features a seat that converts into a lie flat bed. 4 G None No Power Seat 4 G is a standard Business Class suite that features a seat that converts into a lie flat bed. 4 K None No Power Seat 4 K is a standard Business Class suite that features a seat that converts into a lie flat bed. 45 D None No Power Seat 45 D is a standard Economy Class seat that juts out into the aisle and is often bumped by other passengers and the crew in the aisle. 45 G None No Power Seat 45 G is a standard Economy Class seat that juts out into the aisle and is often bumped by other passengers and the crew in the aisle. 49 D None No Power Seat 49 D is a standard Economy Class seat in the last row of the plane and may have limited recline. The proximity to the lavatory and galley may be bothersome. 49 F None No Power Seat 49 F is a standard Economy Class seat in the last row of the plane and may have limited recline. The proximity to the lavatory and galley may be bothersome. 49 G None No Power Seat 49 G is a standard Economy Class seat in the last row of the plane and may have limited recline. The proximity to the lavatory and galley may be bothersome. 5 A None No Power Seat 5 A is a standard Business Class suite that features a seat that converts into a lie flat bed. 5 G None No Power Seat 5 G is a standard Business Class suite that features a seat that converts into a lie flat bed. 5 K None No Power Seat 5 K is a standard Business Class suite that features a seat that converts into a lie flat bed. 50 C None No Power Seat 50 C is a standard Economy Class seat whose proximity to the lavatories and galleys may be bothersome. 50 H None No Power Seat 50 H is a standard Economy Class seat whose proximity to the lavatories may be bothersome. 51 A None No Power Seat 51 A is a standard Economy Class seat in the last row of the plane and may have limited recline. The proximity to the lavatory and galley may be bothersome. 51 C None No Power Seat 51 C is a standard Economy Class seat in the last row of the plane and may have limited recline. The proximity to the lavatory and galley may be bothersome. 51 H None No Power Seat 51 H is a standard Economy Class seat in the last row of the plane and may have limited recline. The proximity to the lavatory and galley may be bothersome. 51 K None No Power Seat 51 K is a standard Economy Class seat in the last row of the plane and may have limited recline. The proximity to the lavatory and galley may be bothersome. 6 A None No Power Seat 6 A is a standard Business Class suite that features a seat that converts into a lie flat bed. 6 G None No Power Seat 6 G is a standard Business Class suite that features a seat that converts into a lie flat bed. 6 K None No Power Seat 6 K is a standard Business Class suite that features a seat that converts into a lie flat bed. 7 A None No Power Seat 7 A is a standard Business Class suite that features a seat that converts into a lie flat bed. 7 G None No Power Seat 7 G is a standard Business Class suite that features a seat that converts into a lie flat bed. 7 K None No Power Seat 7 K is a standard Business Class suite that features a seat that converts into a lie flat bed. 8 A None No Power Seat 8 A is a standard Business Class suite that features a seat that converts into a lie flat bed. 8 G None No Power Seat 8 G is a standard Business Class suite that features a seat that converts into a lie flat bed. 8 K None No Power Seat 8 K is a standard Business Class suite that features a seat that converts into a lie flat bed. 9 A None No Power Seat 9 A is a standard Business Class suite that features a seat that converts into a lie flat bed however, the proximity to the galley may be bothersome. This seat is missing a window. 9 G None No Power Seat 9 G is a standard Business Class suite that features a seat that converts into a lie flat bed however, the proximity to the galley may be bothersome. 9 K None No Power Seat 9 K is a standard Business Class suite that features a seat that converts into a lie flat bed however, the proximity to the galley may be bothersome. This seat is missing a window. There are 50 hours of audio in each personal in-seat audio-video console. Each seat has personal television with Audio and Video on Demand. Power ports are accessible from every seat in Business Class. In Economy, power ports are located two per quad (seats D and F), one per double (seats A and H), and two per triple (seats D and F). For Air Canada's international services aboard this aircraft, complimentary food and drink are offered. An enhanced meal is offered in Business Class. For domestic and transborder flights over 90 minutes, Air Canada operates its Onboard Cafe in Economy Class and charges for alcoholic beverages, snacks and meals. As of May 1 2010, Air Canada only accepts credit cards onboard. Economy Class passengers purchasing a Latitude fare (full Economy) may show their boarding card for complimentary drinks, snacks or meals. Vouchers may be purchased in advance of flight which provide a 20% savings. Business Class passengers receive free bar and meal service. This aircraft features seat back televisions and audio at each seat, even for short domestic services. Passengers should bring their own headphones to avoid a potential $3CAD charge. This is a horrible seat. Worst than economy. Rows 13 and 14 have way more leg room. Its complete ripoff to call this premium economy. Shame on you Air Canada!!! first of all the configuration of the suite is totally awkward on takeoff and landing . Please know that all the seats in the first row have NO WONDOW. Seats are very narrow IMO .... the walls around the seat make you feel wedged in and I am not a big person. (5"7, 150lbs) I would avoid flying on this plane next time ...it feels OLD and dated. Excellent Air Canada Signature Suite Seat which benefit from an important height given the absence of overheadlockers in the central row. Plenty of spaces for personal belongings. 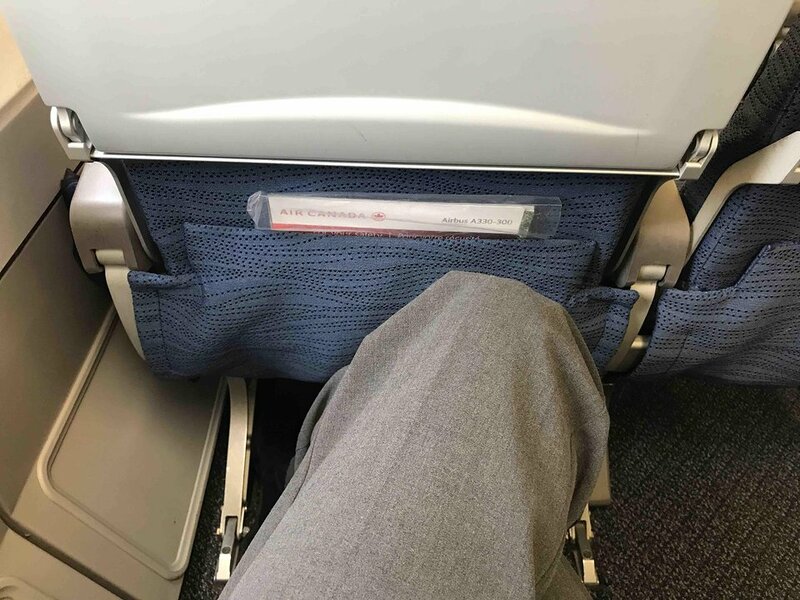 I flew on Air Canada's A333 from Brussels to Montreal and paid for the exit row. I was a little worried about the door taking away space but once I sat in the seat I must admit this is probably better than premium economy. I am 6'6" and had LOTS of room, will definitely buy this seat again. 12D should be marked in red. There is no leg room at all - much better to fly economy and have more leg room. These seats on row 18, they do not have extra legroom, only extra knee room. you can not stretch your legs as you can on the ordinary seats. It is still very comfortable, but be aware of this in case you pay for this seat. The USB port is poor. Very difficult to position the plug in the socket to get a constant power supply. A lot more room then all other seats. (Shoulders) you have a lot more personal space. In my opinion, this seat should be marked green. Just as 9k. Very low or no noise from the galley. Only negative, you have no window, however, you can watch over your shouler and look outside of the window of seat 8. But, how the seats are put in the cabin, you actually never watch outside. Premium Economy. Very nice leg room, great views of the Rockies from the window. I'm 6'2 230lbs and could cross my legs without issue. Great recline too (17.8 cm/7 in). The window alignment for this seat is off, making it impossible to look out the window without straining your neck. In addition, the aircraft is very ssted and the pocket on the seat in front (on 18A) is broken creatung friction between your knee and the seat in front. Avoid this seat entirely. Premium Economy row 12 has amongst the worst seats on all the plane. The legroom is significantly reduced compared to the other Premium Economy seats and worse than a standard economy seat due to the wall proximity. I think its an embarrassment that Air Canada sells these seat as Premium Economy. A nice premium economy seat with lots of recline and room to stretch out. Luckily on my flight there were only 6 seats occupied in this section, so lots of room to stretch. Seats in this section are not the same as the new style premium economy on the 777 or 787, but are more like the business class seats on short haul flights, and have the older style In-flight entertainment system. Only note of caution: Row 12 on this aircraft does not have much legroom due to the close position of the bulkhead. A couple of passengers on my flight in front of me in 12H and K moved to other seats because of this. Not sure why Seatguru has these seats marked green. Excellent seat - full recline to bulkhead behind this row. Seats are the same style as on the 787/777 but feature the older THALES AVOD system. Air Canada flies 1 versions of Airbus A330-300.